Well I never, Fiat 500s are made in Poland. I never would have thought that - would you? 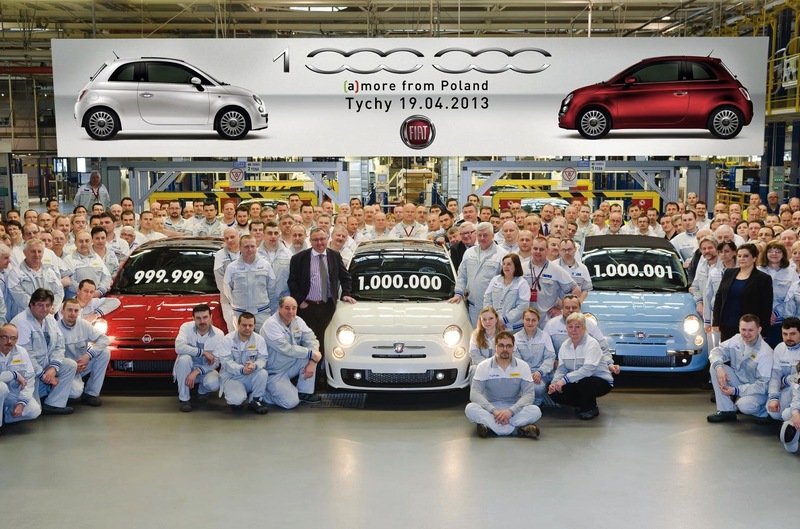 But they are and the factory at Tychy has amassed a total 1,000,000 Fiat 500s since 2007. That's approximately 555 Fiat 500s per day, fact fans! The 500s made in Poland are sold in 83 countries around the world with the major markets being Italy, UK, Brazil, South Africa, Poland, US and Japan. Since 2011 they're also made in Mexico which has produced 100,000 - so total sales of the 500 have just topped 1,100,000 - a staggering figure. The one millionth Fiat 500 is a 135hp Abarth 500 1.4, painted in white. The 999,999th is a red, 95hp 1.3 Multijet to be delivered to Italy whilst Fiat 500 number 1,000,001 is a light blue 500C, to be delivered to Germany. Well done Fiat on a splendiferous achievement.